Growing up in Europe, we ate bread for breakfast every morning. Lots of butter, a slice of cheese, maybe some liverwurst, or a slice of salami. On Sundays, we were allowed to have cereal. My mom didn’t like all the sugar (smart mom! ), so she would have muesli on yogurt while my siblings and I devoured a box of cornflakes. We didn’t like the muesli back then, and I still wouldn’t buy it even if I came across it in the store (although the nostalgia might tempt me). 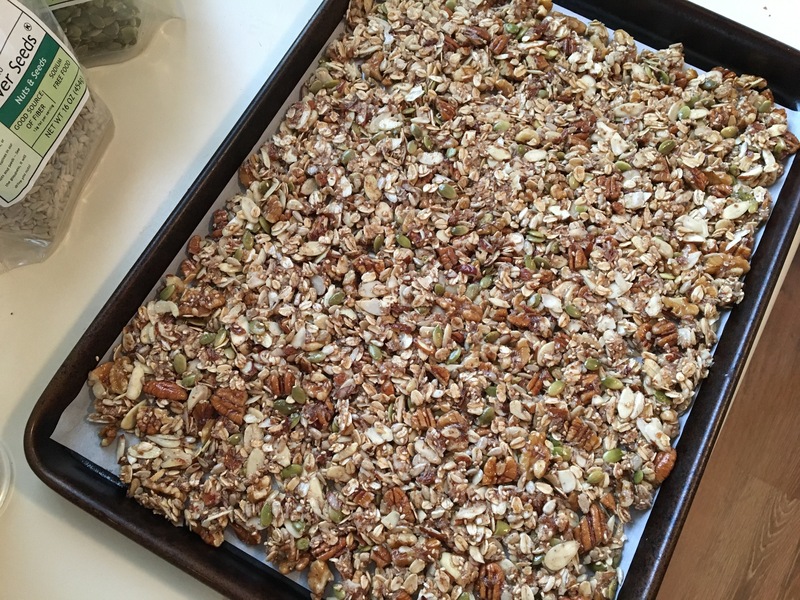 It’s basically raw rolled oats with some nuts, seeds, and dried fruit. 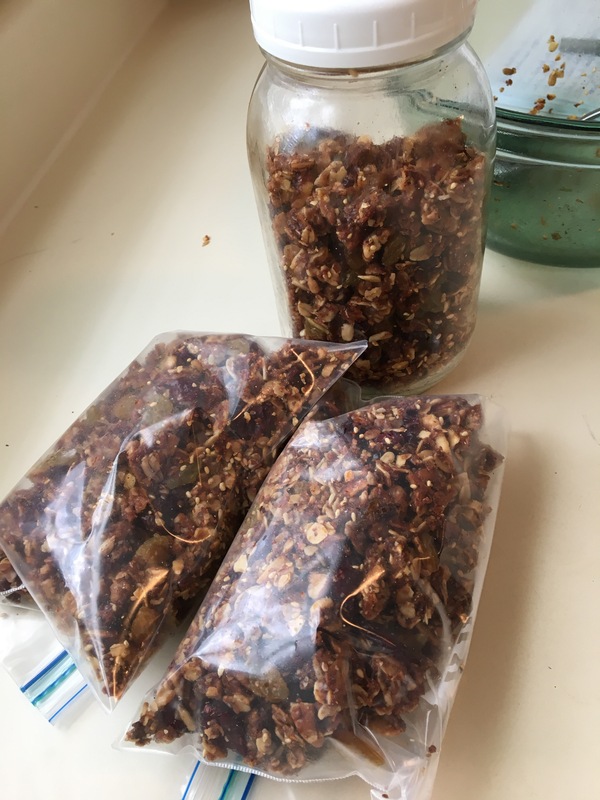 I originally found this recipe on thecafesucrefarine.com, and adjusted it a tad to use what I had in my pantry and to make it a little more affordable. For the nuts, use any you like! You will need three cups of nuts. 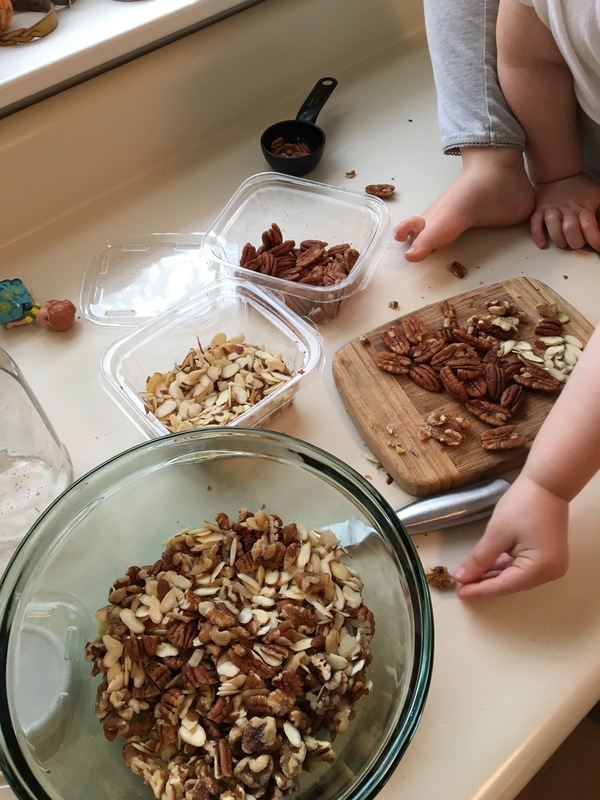 I used almonds, pecans, and walnuts. 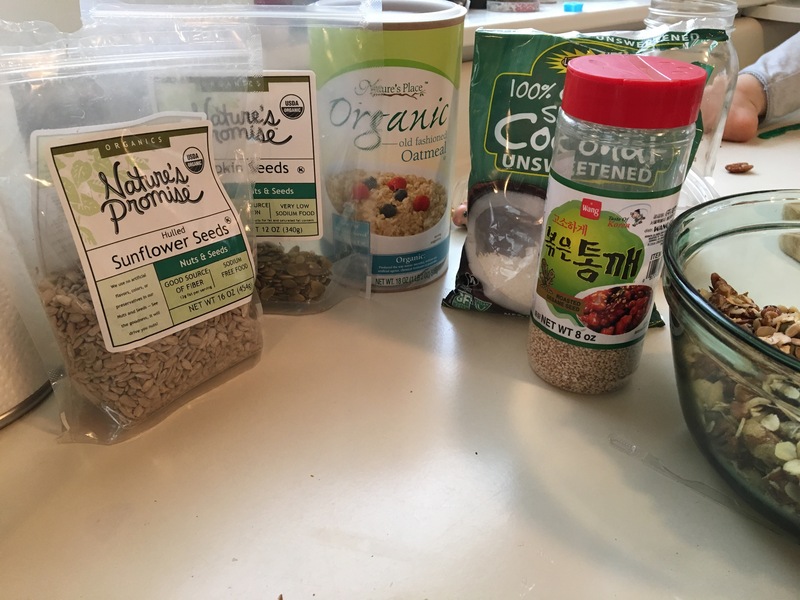 For the seeds, you will need a total of 1/2 cup. I used half pumpkin and half sunflower, but again, use what you have. Same goes for the dried fruit. 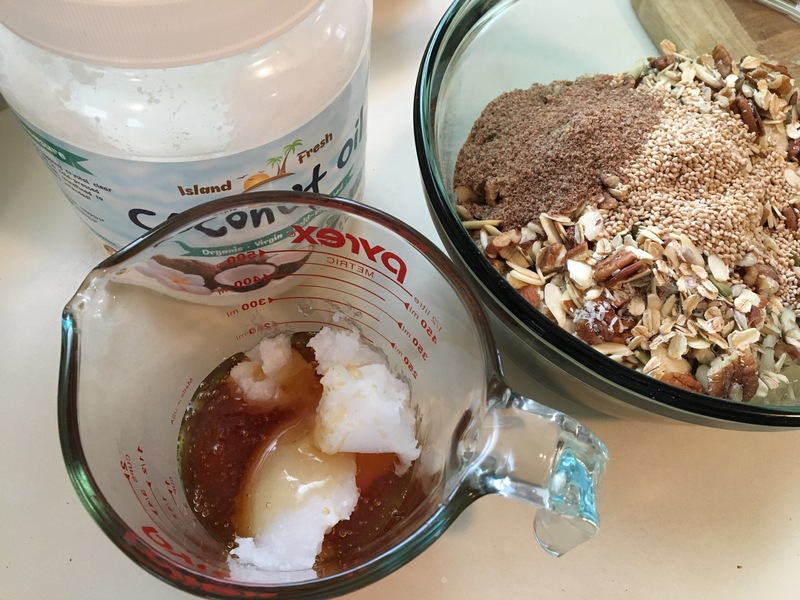 The flax meal, sesame seeds, and coconut flakes are optional! If you don’t have them, don’t let it stop you from making this recipe. You might want to add a little more oats to balance the dry/wet ratio. 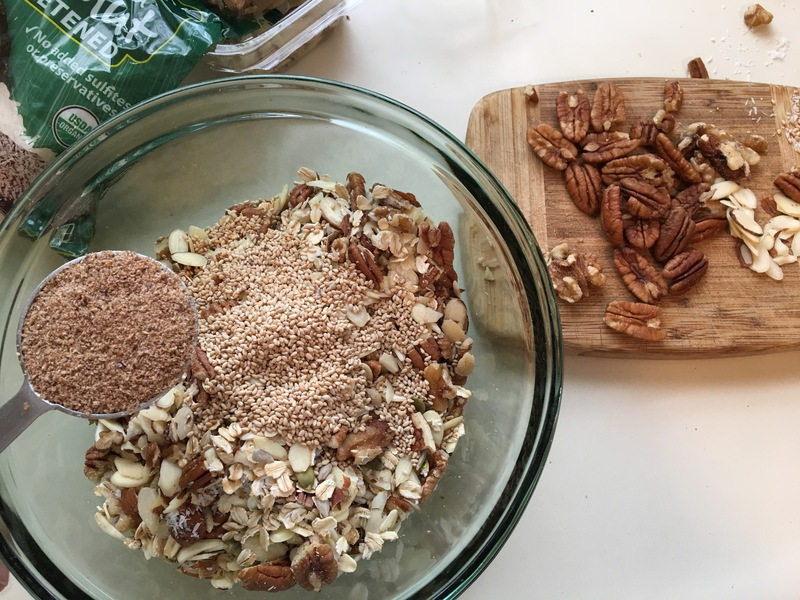 In large bowl, mix all nuts, seeds, oats, coconut flakes, sesame seeds, and flax meal. In a small glass bowl, add honey and coconut oil. Microwave for about a minute to melt. Stir vanilla, spices, and salt into the honey/coconut oil mixture. 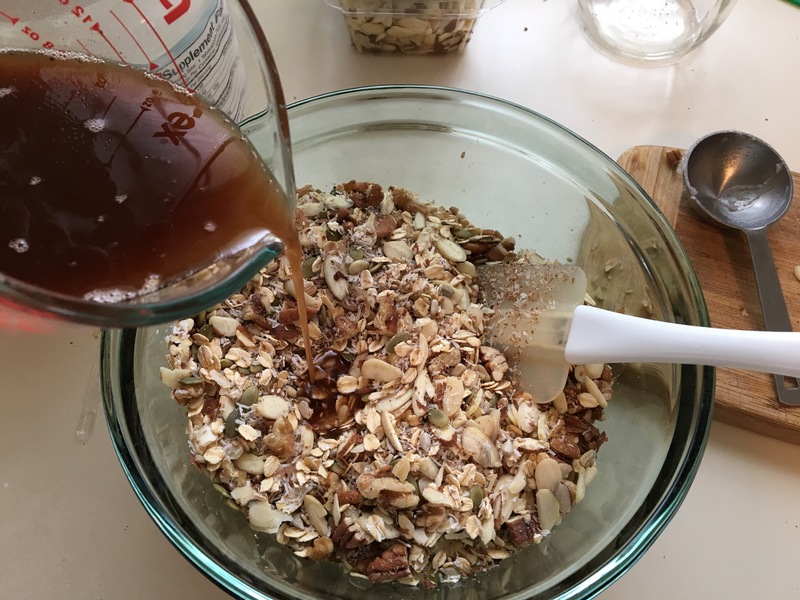 Drizzle the honey/coconut mixture over the nut/seed mixture, and stir/mix until evenly distributed. Spread the mixture onto the sheet pan. Bake for 50 minutes, stirring once after about 30 minutes. Take the pan out and leave to cool completely. When cooled, crumble into a large bowl, and add the dried fruit. Store in a well-sealed container in the pantry. Keep what you will not use within 10 days in the freezer. This recipe is so delicious you guys! I have a very hard time not eating it right off the pan as soon as it cools. 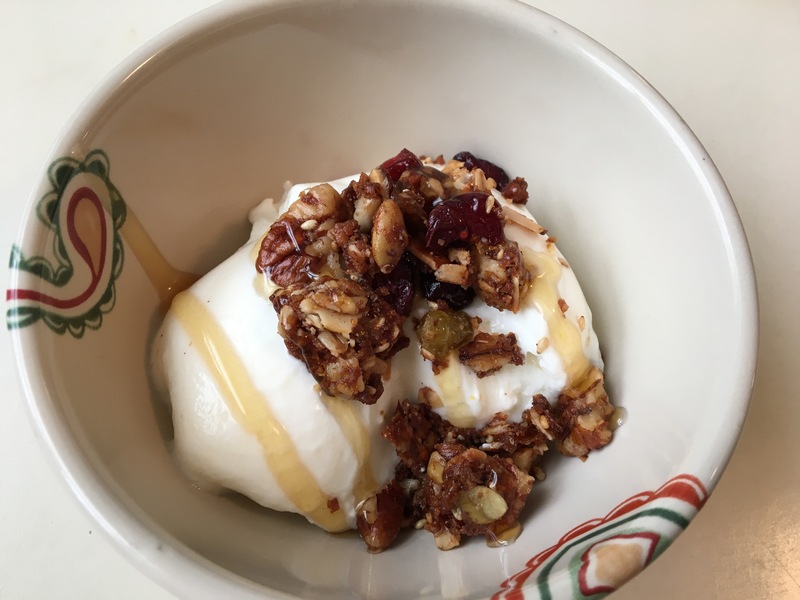 Great on yogurt, ice cream, as a crumble topping for baked fruit, or on some fried banana with whipped cream… you will never buy packaged granola again! Ps. This is a great baking project to do with kids! There isn’t anything they can’t snack on before it’s cooked, and there’s lots of dumping and mixing involved.